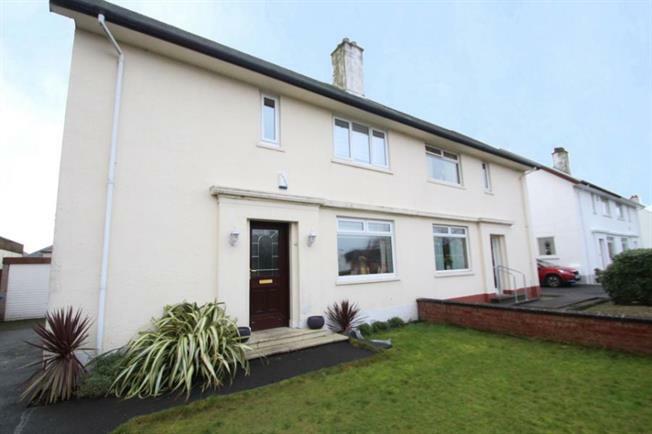 3 Bedroom Semi Detached House For Sale in Irvine for Offers Over £160,000. Offered to the market is this rarely available, excellent home positioned on Bank Street. A spacious three bed semi-detached house which is situated on a large plot of land. Spacious gardens to front and rear, with off street parking, double glazing and gas central heating, make for a fantastic family home. This well presented family home provides great living space for the modern family. In summary the property layout extends to a spacious hall offering good storage, access to bathroom, completed in contemporary style with bath, over shower, WC, WHB and towel rail. A delightfully spacious, front facing and open living room with two large windows allowing for plenty of natural light, feature fireplace, and traditional high ceilings, all which really do make for a great living space. There is also a conservatory to the rear of the property which adds additional space to this fantastic home. A modern kitchen affording both wall and base units complete the lower level. The first floor comprises of three double bedrooms, all of which have fitted cupboards. The master bedroom is rear facing with a good sized window again allowing plenty of natural light. Bedroom 2 is rear facing also, with good storage options. Bedroom 3 despite it being the smallest is still a good size with fitted cupboards again and being front facing. Externally the property sits on a large plot of land, off street parking, garden to the front mainly laid in lawn, and to the rear a very spacious garden again laid in lawn with brick garage, means this is sure to appeal to the modern family. There is an extensive choice of both primary and secondary schooling available in the Irvine with convenient access to the A77, M77 motorway link and all main arterial routes. This provides easy access for the commuter with links accessing in a Southerly direction towards Ayr and Girvan and the Ayrshire coast and in a Northerly direction toward Glasgow.